In a significant step to boost trade, the India and Turkey today decided to constitute a special bilateral working group drawn from economic ministries to lift the trade turnover between the two countries to $ 1 billion in the next two years. 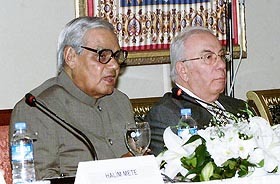 Prime Minister Atal Bihari Vajpayee addresses the India-Turkey Joint Business Meet in Istanbul on Friday. Commerce and Industry Minister Arun Jaitley today categorically stated that India will not blame anyone for the collapse of the meeting but will continue to engage in the future negotiations positively. 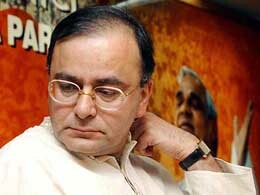 Commerce and Industry Minister Arun Jaitley at the BJP headquarters in New Delhi on Friday. Tax collection was up by 6 per cent at Rs 65,990 crore till August this fiscal from Rs 62,325 crore in the same period in 2002-03, mainly due to buoyancy in corporate tax and excise. Worldwide Immigration Consultancy Services Ltd. (WWICS) here has hailed the decision of the Citizenship and Immigration, Canada, under which applicants applying for federal skilled workers would now require 67 marks instead of 75 points. The economy is improving for the super rich. After two years of declines, the total net worth of America’s richest people rose 10 per cent to $955 billion this year from 2002, according to Forbes magazine’s annual ranking of the nation’s 400 wealthiest individuals. Polaris Software Lab has said it will set up a base in New York and expand its Business Process Outsourcing (BPO) business. NIIT and technical university Rajiv Gandhi Proudyogiki Vishwavidyalaya, University of Technology of Madhya Pradesh, said today they would offer B.Tech (software engineering) degree in India and abroad. Prime Minister Atal Bihari Vajpayee, who wound up his four-day visit to Turkey with an address at the India-Turkey Business meeting, said the long history of friendly contacts should be translated into a vibrant, revitalised economic partnership based on respective strengths. “This should cover not only trade in goods and services, but also two-way investment, third country projects, scientific research collaboration, joint commercialisation of new technologies and many other areas,” Vajpayee said. He said both countries have agreed that they will constitute a special bilateral working group to further this agenda, which should identify areas of promise in hitherto unexplored sectors and analyse how could best be developed. The group will also recommend policy measures to the two governments for maximising the benefits from mutual cooperation. To emphasise the urgency of the task, Vajpayee said it has been specified that the group will submit its recommendations to the two governments within six months. He expressed the hope that the ideas that emerge from the group will be creative and forward-looking. The Prime Minister said in his discussions with Turkish Prime Minister Erdogan, they agreed that despite the rapid expansion of trade turnover to about $ 650 million last year, the full potential was yet to be realised. Even the first target of $ 1 billion turnover by 2005 “is well below the possibilities”. Identifying “some obvious and fundamental” areas for boosting trade, he said the first was the need to strengthen the infrastructure of trade facilitation. The air link between Istanbul and Delhi, which resumed yesterday, was an important first step in travel exchanges, including for business travel. A second obvious problem area, he said, was the lack of awareness in the two business communities of the available opportunities. “This is an equal problem on both sides”. The short point, therefore, was that the two countries should have much more interaction between the business communities through increased travel, seminars and workshops, trade fairs and exhibitions. The Indian delegation has discovered great opportunities for cooperation in textiles, chemicals, two wheeler vehicles and pharmaceuticals. "Now the blame game is on. India is not going to take part in it. We will continue to engage positively till the end. We will have to pick up the threads from where they have been left at Cancun and take the process ahead at the WTO meet in Geneva," Jaitley said after his felicitation at the BJP headquarters. Jaitley said the WTO can move forward only by consensus and this had become very clear at Cancun when the alliances formed by developing nations, G-21 on agriculture and G-16 on Singapore issues of trade and investment, competition polices, trade facilitation and transparency in government procurement, stayed together till the end. Pointing out that the equilibrium at the WTO had changed, he said for the first time in its history there were equitable negotiations with the developing countries led by India, Brazil and China being able to make themselves heard forcefully. "This was a change which was visible at this meeting (Cancun). The combined voice of the developing nations was being heard at par with rich nations like the US and the EU," he said. Taking a dig at EU Trade Commissioner Pascal Lamy who called WTO a medieval organisation after Cancun collapse, he said it was only in ancient institutions that unilateral decisions were made and the multilateral organisation had become truly democratic now by listening even to developing countries' concerns. "This change will have to be accepted by the western world that always thought they can divide the developing nations' alliances by putting pressure," he said. "Every time we were at the receiving end but this time we were on the offensive," Jaitley said, adding that the countries were almost close to an agreement when some of the African countries walked out leading to collapse of Cancun. He said the intense consultations with political parties, trade unions, non-governmental organisations, think tanks, industry and trade advisory bodies, held ahead of Cancun meet, made it clear that everyone was in favour of protecting national interests. Stating that while India had got isolated at Doha, he said at Cancun a majority of WTO members were supportive of India's stand and stood by it. While indirect taxes grew by 7 per cent to Rs 51,460 crore till August, direct taxes were up by a mere 2.1 per cent at Rs 14,530 crore, top Finance Ministry officials told PTI here today. Industrial recovery resulted in higher collections in corporate tax and excise. Excise collection grew by 7.02 per cent to Rs 32,597 crore in the first five months from Rs 30,457 crore in April-August 2002-03, the officials said. Customs mop up also grew by 6.95 per cent to 18,864 crore till August this fiscal, compared to Rs 17,639 crore in the year ago period, they added. Although gross tax collection was up by over 10 per cent at Rs 85,000 crore till August this fiscal compared to Rs 77,000 crore in the same period last fiscal. In August, indirect tax collections were at Rs 10,980 crore this year compared to Rs 10,381 crore a year ago. Said Lt Col. Sandhu, Chairman & Managing Director, WWICS," We welcome the decision that will benefit hundreds of applicants to enter Canada." The Immigration and Refugee Protection Act which was implemented in June, 2002, had changed its selection criteria in mid-process and then the Canadian immigration authority had applied new rules to candidates who had already applied and paid their fees. He said WWICS had filed a suit against the Canadian Government asking for cases filed before June, 2002, to be assessed under the law at the time of filing of the application which had helped mount pressure on government. Now it has agreed to reduce pass marks from 75 to 67, offering some relief to applicants, he added. Microsoft Corp founder Bill Gates, who remained on the top spot, personified the trend toward increasing wealth. His fortune increased by $3 billion to $46 billion this year. Microsoft co-founder Paul Allen held third place, with his net worth rising $1 billion to $22 billion. Investor Warren Buffett kept the No 2 position although his wealth was unchanged at $36 billion. 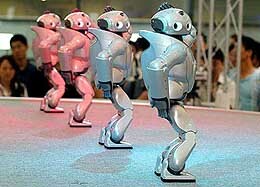 Forbes said the surge in collective net worth was largely due to gains in Internet stocks and tech fortunes. For example, Amazon.Com’s Jeff Bezos saw his fortune expand by more than $3 billion to $5.1 billion as the stock of the online retailer skyrocketed. Bezos was the top gainer on the list and holds spot 32. David Filo, co-founder of Yahoo!, saw his net worth nearly triple to $1.6 billion, tying him with 13 others for the 126th spot. Yahoo!’s other co-founder, Jerry Yang, also nearly tripled his fortune, but he shared the 162nd spot on the list with 16 others with a $1.4 billion fortune. ''We will open a centre in New York and expand sales team in Australia and Europe,'' Polaris Chairman and Managing Director Arun Jain said. The company also plans to expand operations of its BPO subsidiary, Optimus. ''Polaris will add auxiliary capacity in its IE-enabled Services through the subsidiary as part of its efforts to emerge as an competency provider in banking, financial services and insurance (BFSI) space,'' Mr Jain said. For branding, Polaris has lined up significant investments. Cipla Ltd is awaiting approval from the World Health Organisation (WHO) for its anti-HIV drug “Triomune”, “We are in the final stages of the WHO approval for Triomune and hope to get it shortly”, Cipla Chairman and Managing Director Y.K. Hamied told newspersons on the sidelines of a Pharmaceutical Analysts’ Convention organised by the Indian Drug Manufacturers’ Association and the European Pharmacopoeia Commission here today. The Indian Pharma-copoeia has approved the drug and the company has also conducted the bio-equivalence (in terms of efficacy and safety) for Triomune, he said, adding that, the entire data has been submitted to the WHO. Cipla has also registered four or five anti-HIV drugs in South Africa, he said. Mumbai : Indian Hotels Company Ltd, a Tata group entity running Taj hotels chain, is looking at the option to bid for acquiring property abroad as part of business growth plans. Escorts Finance (EFL) plans to delist from bourses after acquiring the remaining 5.13 per cent shares held by public. The Escorts group has made an open offer at Rs 10 per share providing the public with an attractive "exit route" as the share price of EFL was hovering at around Rs 3.70 in the last 26 weeks, official sources said. "This programme will be available to students in 11 cities in India starting next month. The four-year degree programme will also be offered in seven other countries," NIIT Chairman, Rajendra Pawar said here. These include Bangladesh, Ghana, Mauritius, Nigeria, Sri Lanka, Vietnam and Yemen. The partnership will allow NIIT students who have completed DNIIT programme to get lateral entry into the B.Tech, he said, adding that the programme will allow students to choose their specialisation track in seventh semester. In the last semester, students will gain six months of academically rigorous internship in the industry under the direct supervision of NIIT. SAS Nagar: Ranbaxy Laboratories has been given National Safety Awards under various categories for 2001 and 2002. The company’s active pharmaceutical ingredients facilities at SAS Nagar and Toansa (Punjab) were given the awards at a function at Vigyan Bhavan, Delhi, on September 17. These were presented by the Minister for Labour, Dr Sahib Singh Verma. CHANDIGARH: The Haryana Government's plan of getting an agent for online lottery operations has run into trouble again with the state government today finding unacceptable the only offer coming from Essar Ltd.
Bangalore: Delphi Technical Centre, plans to increase the strength of its engineers to 360 from the existing 260 by the end of 2004. MUMBAI: The Reserve Bank of India today notified that foreign institutional investors (FIIs) cannot purchase further shares of Digital GlobalSoft without prior approval of the apex bank.